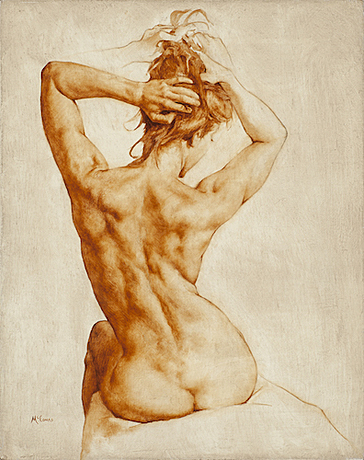 Sarah, Oil on Linen, 20" x 16"
Jim's work is predominantly figurative as he's particularly inspired by the grace, gesture, and beauty of the human form. His goal is to incorporate the figure into compelling visual compositions that capture the eye and engage the mind. Along those lines he sees the role of the figure in his art much as the role a dancer plays in a ballet: profoundly moving in and of itself, yet an integral part of a larger story. Jim is a classically trained contemporary realist whose work hangs in private collections nationally and inter¬nationally. Accolades include "Best in Show" (Lines Into Shapes 2016, Estes Park, CO), and "People's Choice" (Au Naturel 2015, Astoria, OR), and he's taught figurative painting at the Classical Art Academy in Boulder, Colorado. Jim also served 26 years in the USAF as an F-15 fighter pilot. He lives with his wife, Lea, and their two dogs in the hills southwest of Boulder.